The Shelter Logic 12 x 30 Super Max Commercial Grade 12 Leg Canopy Shelter features a study, durable field-tested welded 2-inch diameter steel frame and to withstand severe weather conditions. The cover is a full one piece valance, enhanced weaved, triple layer polyethylene that is 100% waterproof. The shelter is treated for UV, fungi, mildew and faded. Shelter Logic 12 x 30 Super Max Commercial Grade 12 Leg Canopy Shelter is manufactured by Shelter Logic and has a 10 year life expectancy. I need a short-term shelter for my 12' 7" tall, 40' long and 12' wide RV. Do you have anything that is this large or larger? We have a Rhino Shelter RV Shelter that measures 14 x 42 x 15. That is the closet shelter we have to meeting your needs. What is the total weight and the shipping dimensions for this canopy? Total weight: 230.6 lbs. Box dimensions: Box 1: 78 x 16.9 x 7.3 in. Box 2: 78.9 x 16.9 x 8.5 in. Do you offer the 12'x30' pole tent with legs that are 10' high? The tallest 12x30 we offer, the Shelterlogic 12x30x11 ShelterTube Snow Load Rated Shelter, is about 8.5 feet at the sides. The Shelter Logic 14 x 32 x 12 Peak Style Portable Garage Canopy is 9'4" at the sides and has a peak height of 12 feet. Do you offer a 12' x 30' that is 10' high on one side and at least 12' high at peak? The tallest 12x30 we offer, the Shelterlogic 12x30x11 ShelterTube Snow Load Rated Shelter, is 11' at the peak. 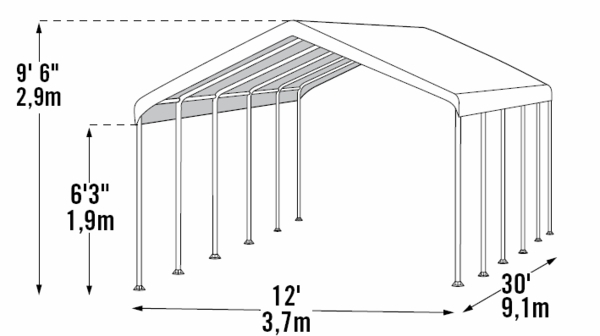 The Shelter Logic 14 x 32 x 12 Peak Style Portable Garage Canopy is 9'4" at the sides and has a peak height of 12 feet. Does this product have a carry bag/case, etc. to store poles? Unfortunately, we do not carry a storage bag large enough for this product. I need a little more clearance. 12 foot would be ideal so I can park my center console boat. I am thinking making a 4 ' high block base unless you have a "Riser" option. If you need a 12' door clearance, you may consider our Shelter Logic 15 x 24 x 12 Peak-Style Portable Shelter. Can an end and one side be ordered? We do not carry individual walls, but carry all four walls in one kit. 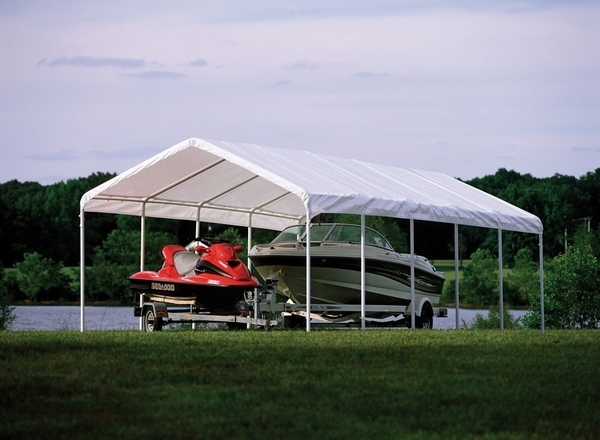 You can find the Shelter Logic White Enclosure Kit for 12 x 30 Canopy by clicking here.